Hawaiian-born surfer Gerry Lopez needs no introduction. One of the pioneers of The Pipeline, his smooth and graceful riding in contrast with the powerful wave has made him an icon. Later, his travels to exotic places like G-Land further reinforced his legendary status. We were fortunate to ask him a few questions. It was simply a great time to be a kid and a good place to grow up. In the 50’s, Hawaii was a pretty sleepy place, but it started to change pretty rapidly after statehood in 1959. Surfing was becoming popular and surfboards were being made out of foam. Guys who were older than me, they had to begin surfing on a heavy solid wood board. For a young kid, it made surfing much more accessible. I was only 10 or 11 years old at the time. Looking back when I grew up, it seemed like it was a great time to be a kid. And a great time to be a surfer. The first time you get a ride on a surfboard and you are being propelled along by a wave, it’s probably as close as humans can get to being able to fly like a bird. I’ve tried to think about it and figure out what it is exactly that makes it so wonderful. I guess it’s a sense of freedom. When you’re gliding along on a wave, you are kind of leaving gravity behind—and you soar. It’s such a tremendous feeling that grips you down to your core. Like I said, I’ve been trying to think about what it is exactly. It is much more than physical and mental; there must be some spiritual stimulation that we may not be aware of. We get something more from surfing than from other things that might be stimulating or exciting. And that’s what is so unique about surfing. There is just this little extra of this mysterious something that makes you want to come back and do it more and more. After every surfer gets hooked into surfing, or “catching the bug,” you try to improve. The way to do that is you look at guys who are better at it and you try and copy them. When I was in the eighth grade, I knew that Paul Strauch was one of the best surfers in our school even before I actually saw him surf. There was a beautiful shot of Paul surfing at Haleiwa on a poster doing his Cheater Five, crouched down on his board with his left foot extended out right on the tip that everyone admired, including myself. How important is style in surfing? The first time I ever saw myself in a surfing movie, I thought to myself, “My God, that can’t be me—that guy has such an awful style.” What you think you look like surfing is different than what others think. I guess style is what sets one surfer apart from another; the ones whose styles you like are the ones you watch the most closely. Style develops over a long period of time. 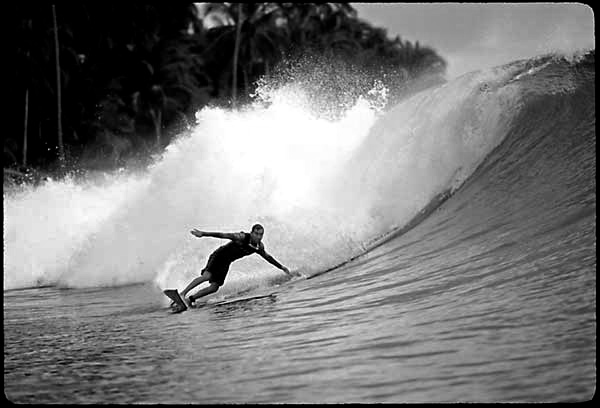 And as you become more skilled at surfing and you move beyond the basics of standing up and turning, you can then focus a little more on how your body is positioned. With today’s use of video cameras, it is much easier to study how you look than it was back in the days of film. When I was in the 1973 World Contest in San Diego, I thought I surfed pretty good, but I finished in last place. My girlfriend at the time said I didn’t win because she said I didn’t do anything. But that was kind of my style; I kinda stood there and let the wave do everything. The small waves didn’t do much, so I didn’t do much either. At the Ala Moana bowl, the wave did a lot; I could just stand there and I would let the wave do everything. How were you able to maintain a calm composure when you were dropping into The Pipeline? I had a really good surfboard. What I mean is, if you had good equipment and you had confidence in your equipment, you were able to get away with quite a bit. This was in the early 70’s and the shortboard was in the developmental stage. Nobody at the time knew what the perfect surfboard was supposed to look like. I built my own surfboards specifically for a particular spot. Boards didn’t last long at The Pipe, so when you broke one you just made a new one, trying to improve it over the last one. I just happened to get really lucky when I built my next board for The Pipeline. I built a board I was so confident on that I was able to just stand there and become a little more casual about it because I knew my board would carry me through. People always say to me, “Come on, there’s got to be more than that!” But it really is just you and your board. The wave is just the music and if you get a good partner (in your surfboard), you can dance pretty good. That’s how Shaun remembers it. Actually, being a shaper and surfboard builder, I was quite impressed with his board. It was a radical departure, as far as overall rocker, from anything anybody was riding. He remembers it was me who was laughing at it, but I think it was Rory (Russell) that was doing all of the laughing. I was busy examining it. It was exactly the opposite of how I thought it would perform when I watched Shaun ride it; he rode the hell out of the thing. Well, in regards to surfing, I’ve learned that there is always another wave coming. Translated that means there is always tomorrow. No matter how badly you get caught inside, if you can just hang in there and keep paddling, the set is going to pass and there will be a lull afterwards. So don’t give up, just take your pounding, wait until the set passes, then make your move. Perfection, passion, intelligence, individuality. All those things stimulate me and make me think. They make me want to improve and do a little bit better. That I’m still here. That I have a wonderful family and a whole bunch of friends. And that I’m still paddling. What Golden Rule do you live by? What is your relationship with Patagonia like? My job description is ocean ambassador. I work with them to position Patagonia as a surf/ocean company because it is more generally known as an alpine/mountain climbing one. Everyone at the company is a surfer and ocean-oriented so this made a lot of sense. I interact in many of the company’s different divisions—writing, doing photo work, product testing with their clothing, wetsuits, and gear—and I work with Fletcher Chouinard on surfboards. Fletcher Chouinard Surfboards has a very green approach, using polystyrene cores and epoxy resins. There is a lot of information exchanged (with my shaping and longtime surfboard-building experience and with their green technologies). Patagonia is a dream company to be involved with. Their creed is: make the best product, cause no unnecessary harm and use business to inspire and implement solutions to the environmental crisis. I am really honored and stoked to be a part of this company and to have a relationship with them. How is snowboarding like surfing? What are you doing these days with surfing? I go surfing as much as I can—whenever its good here in Oregon or if I can take a trip somewhere. I really got into stand up paddleboards. It’s been really exciting for me, especially in bigger waves. 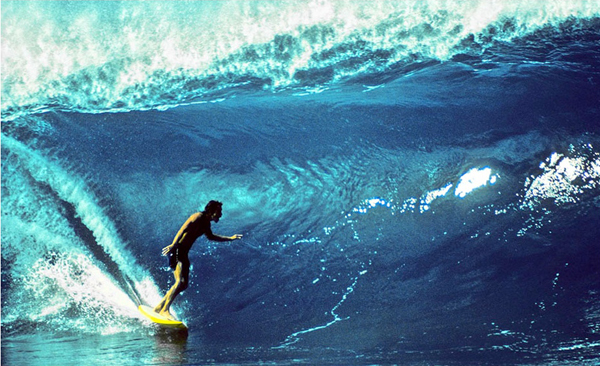 I’ve been surfing for over 50 years, and I’ve seen a lot of things come and go with the sport. Surfing on a small board is really limiting because you have to sit right where the wave breaks and you end up missing a lot of waves. The sport has grown so much; the crowds are so big. Surfing becomes frustrating for a lot of surfers. At this point in time, it seems stand up paddle surfers are easy targets to take out some of these frustrations on. But what I like about the SUP boards is the ability to tour. Say there are a bunch of guys out at one peak, but a quarter mile down the beach is another (empty) peak. It’s no sweat to cruise down there and check it out. In the 1980’s, windsurfing came into some of the surfing areas and there was a lot of friction there. And the same thing happened when the longboard became popular again in the 1990’s; the guys on the longboards antagonized the shortboard riders because, often times, a lesser-skilled surfer on a longer board could get the wave before a better surfer on a shorter board and this caused tension too. I think these things have a way of working themselves out. Who are the people who are shaping the path for surfing today? There’s just so many good surfers. The level of surfing is so high right now. And the list is endless—Kelly Slater, Rob Machado, Laird Hamilton. We could sit here all night. There’s this kid from Maui, Matt Meola, who is a friend of my son, Alex, since birth. He sent me this video that was just incredible. He’s leaping his surfboard all over the wave just like a snowboard or a skateboard. I told him he doesn’t need to enter competitions to get noticed; he could just contact sponsors to have him do exhibitions. The kids today are doing things that the previous generation never even dreamed about. But I should mention some of the old surfers who are shaping the path for the surfing industry, which is the foundation of our sport today—Yvon Chouinard of Patagonia, Paul Naude of Billabong, Bob McKnight of Quiksilver, Richard Wolcott of Volcom, Sparky Longley of Rainbow Sandals and many others. All these individuals are ensuring a future for surfing with the business decisions they make today. G-Land. For the kind of surfing I like and the kind of wave I like, it was the most perfect place I have found. It’s long, it attracts a swell, it’s fast and hollow, and very challenging. It’s become more crowded than when we first surfed there, but it is still an outstanding wave. I go on a lot of boat trips, but to me, G-Land still stands out as the best. I haven’t been there in a while, but I think about it all the time. But the reality is, these days my favorite spot is any spot I can go surfing at—no matter what the waves are like. Brown rice, tofu and veggies, and salads. At my age, in order to stay active, I would generalize it this way: a yoga/surfing lifestyle. Yoga has been around for a very long time and is a totally balanced and well-developed system that is beneficial to all. Surfing? Well, that speaks for itself. Mostly old music from the 60’s and 70’s – Elvis, Jimi Hendrix, Ray Charles, Jackson Browne, Dylan, The Beatles, the Stones, whatever. My wife and son kinda shake their heads, but we all listen to Jack Johnson together. What organizations/causes do you support? I support all environmental causes, particularly any of them that have to do with the ocean. The Surfrider Foundation does a good job. Sea Shepherd. Anybody that is consciously trying to preserve the Earth, not use it and abuse it. Any organization trying to leave the world at least like we had it (for our kids and future generations to enjoy) has my support. I also support most health-related research that can make a difference with the troubling increase in cancer and other illnesses. I support yoga in whatever style or school that can generate interest and enthusiasm in people who aren’t into it. What’s next for Gerry Lopez? More information about Gerry Lopez Surfboards can be found here. Read more about Gerry’s involvement with Patagonia here. Surf photography courtesy of Jeff Divine.